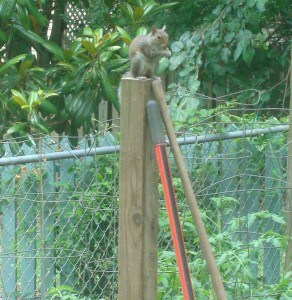 I’ve concocted a plan to keep the squirrels out of my tomatoes this summer. I’ve started putting my contraption together, but since I don’t have any ripe fruit yet for them to steal, I haven’t been in any hurry to complete my brilliant project. Today, however, the squirrels are mocking my efforts. Now the gloves are off.